Harrington was writing about business, but his words ring just as true when it comes to your health and wellbeing. We wholeheartedly believe, and the results that our clients achieve reinforce this every day, that measurement is the first critical step towards taking charge of your health and maintaining motivation on your journey to reaching your ideal weight with more muscle mass. And it is maintaining motivation that is key. Starting to make better food choices and exercise more is easy. You can see that in action in the first week of January as everyone heads to the gym and stocks up on supplies for salads and green smoothies. But by late February (if it’s even that long! ), life starts to get in the way, excuses are made and before you know it, you’ve not been to the gym for four weeks and you’re having takeaway pizza for dinner for the second time in a week. Improving health and fitness doesn’t come from New Year resolutions and January detoxes. It comes from consistent actions and choices all year round. A DEXA scan to determine your starting point and periodic scans throughout the year to track the changes in your body composition can do wonders to keep you on track. Visibly seeing the reduction in your body fat percentage and an increase in muscle mass really reinforces your commitment to achieving and maintaining a healthy weight with a good proportion of lean tissue. But the DEXA scan didn’t just provide motivation at the beginning for Paula. As she was having regular scans to review her body composition, Paula was able to bypass the frustration that many people have when they are trying to improve their health and lose weight, but the number on the scales just isn’t shifting as much or as quickly as they might have hoped for. “When you lose weight, you sometimes don’t see yourself how much weight you have lost. 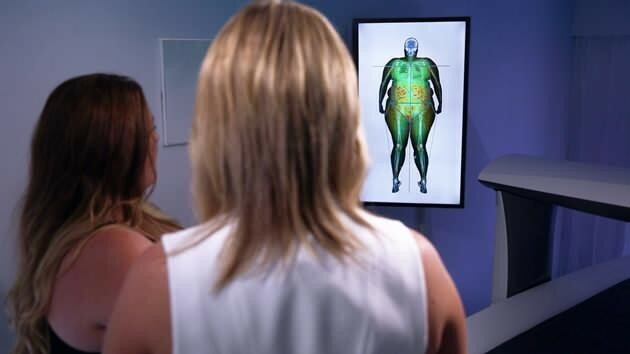 You might think, oh, I’ve only lost 12 kilograms, but when a scan can show you what that loss of 12 kilograms actually means in health and not just weight, it can really give you a mental edge to continue to work towards your goals,” says Paula. Don’t let your motivation to change your life and achieve your health goals fizzle out by the middle of February. Don’t let yourself become demoralised by the small changes you see on the outside, when there could well be much more significant changes to the very dangerous visceral fat on your insides. Come in for a DEXA scan, get a true picture of your health and how that IS changing as you get leaner and reduce your body fat percentage. And by this time next year, you really will see the results of making all those small actions and choices throughout the year.